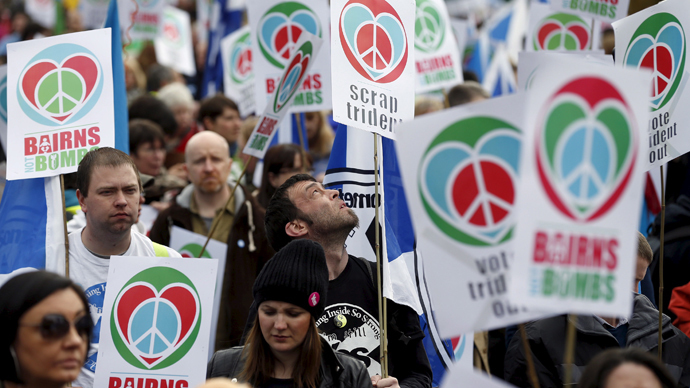 Over 2,500 protesters have hit the streets of Glasgow for a ‘Bairns not Bombs’ demonstration, calling for UK's Trident nuclear weapons program to be scrapped. “One of the biggest decisions that MPs will take in the next Parliament is whether to waste £100 billion on renewing these morally obscene weapons. Broken down, that'll be around £3 billion a year, peaking at an eye-watering £4 billion in the 2020s,” she said. “Your job over the coming weeks is to make sure people hear the alternative voice. You need to take the message out day after day, to friends, family, your colleagues, your neighbors, make sure they bring the issue of Trident to the top of the political agenda when they decide how they will cast their vote. Let's convince everybody in this country to vote no to Trident," he told the crowd.